The city of L’Aquila, Italy was turned to rubble by a powerful earthquake in April of 2009. As is the case with many natural disasters, public attention has steadily declined since the earthquake. A year and a half later, little progress has been made to rebuild this ancient city. So we decided to offer help in the best way we know how: with technology. As we outlined in this post, employees from the Google SketchUp team offered to assist in the effort. Workshops were held to collect photographs and train local volunteers in the use of SketchUp as a geo-modeling tool. While this was happening, we were collecting aerial imagery that would enable us to make L’Aquila available to geo-modelers around the world in Google Building Maker. With L’Aquila now available in Building Maker, we’ve organized a follow-up workshop where Google staff will return to work with volunteers to model the city. The workshop is scheduled for January 22-23 at the University of L’Aquila. Seating is limited. Register here if you would like to attend. Of course, not everyone who may be interested in volunteering can attend, so we’d like to invite geo-modelers around the world to join us virtually. In addition to supporting a good cause, geo-modelers who join the effort will be awarded a special badge in the Google 3D Warehouse. 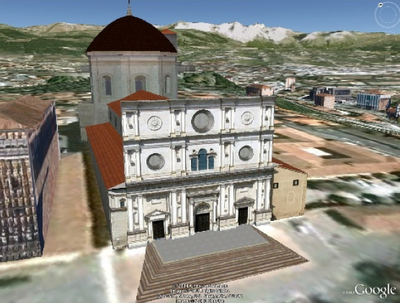 Visit the L’Aquila 3D website to learn more about the project. Zoom into the city and find a building of interest. Tip: be sure to avoid buildings that are currently being modeled by others by looking for blue dots. When you’ve finished your model, publish it to the 3D Warehouse. If it passes our review, it will appear in the 3D Buildings layer of Google Earth within a week or two, depending on the volume of models.